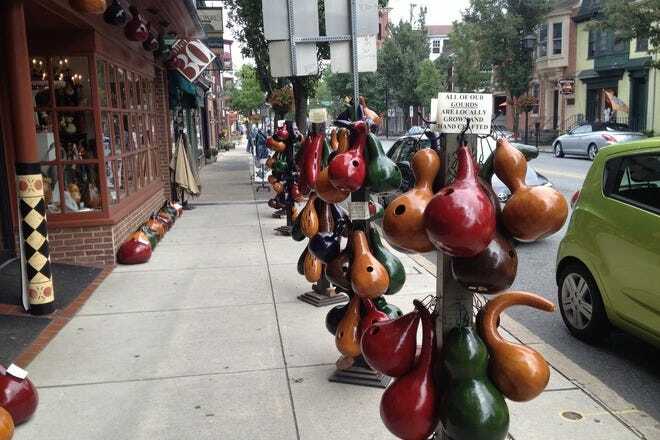 The best places to shop in Gettysburg include small shops that are historic, fun, eclectic, colorful, local and global, handcrafted, and more. In the shops around town, you can find artifacts, gifts, collectibles, and souvenirs to take back home. Codori's, located in Lincoln Square next to the Gettysburg hotel is a bright shop where you can find yourself getting lost in all the unique global goods that line its shelves. A great place to acquire German nutcrackers or smoking men, or maybe even start a collection of something else it has in its inventory. There are plenty of shops in town that sell Civil War inspired knick knacks and paraphernalia. However, if you're looking for unique gifts, head into Lark Gift Shop. This bright store has beautiful decorative and handmade gifts for either your home or a friend's. Walk into Gallery 30 and you'll see rows of handcrafted items from local artists and craftsmen. You're bound to see something colorful before you even head into the door. 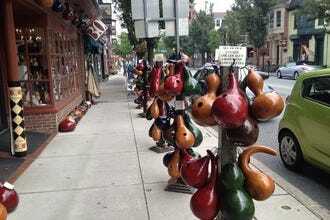 Gallery 30 sells things like jewelry, decorative gourds grown right near town on local farms, cards, and other household items. 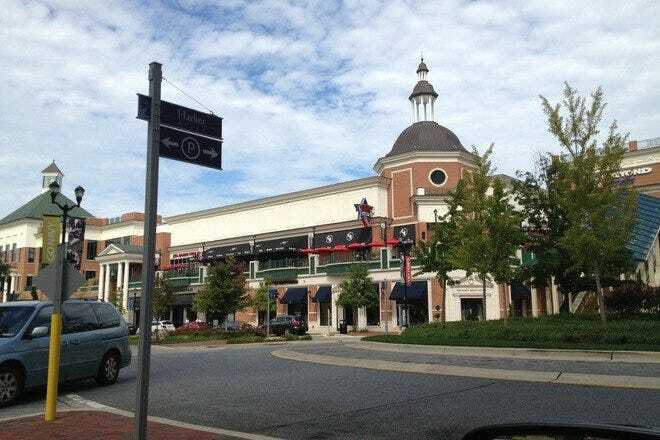 If you're looking for more mainstream shopping, the Outlet Shoppes at Gettysburg has dozens of national brand stores featuring apparel, accessories, shoes, and home furnishings. Forevermore has all your scrapbook needs in one location. The retail store is over 3000 sq. ft. full of scrapbooking. products. Featuring unique Civil War page kits, custom die-cut embellishments and hard to find travel, cruise and color-coordinating 2-page designer pages. You can find everything you need here to make your best Civil War / Gettysburg vacation scrap book ever. They have a Hot Foil Embossing machine to customize your albums or if you buy one of theirs. They offer custom die-cuts, most while you wait. They offer custom T-shirts, Coffee mugs and Travel Mugs. You can usually find a store coupon online. Located a short walk from the battlefield, the Gettysburg Heritage Center has been serving visitors for 50 years. The center features a new way to experience the battle and allows you to see what life was like for civilians as well soldiers. Visitors will enjoy a look at historical artifacts, documents and interactive displays. 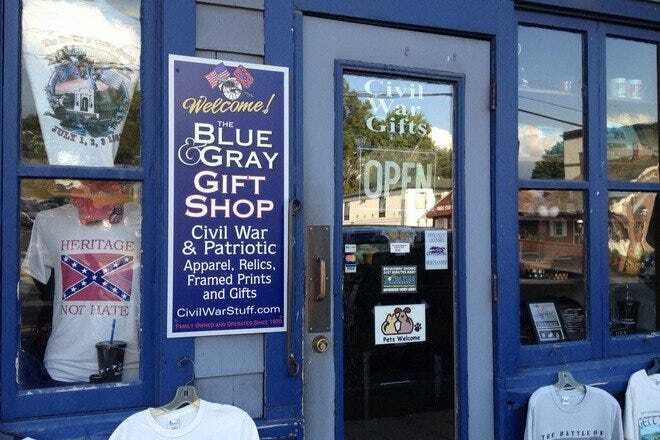 Blue and Gray Gift shop is a family owned and operated company who have been serving local folks and visitors in Gettysburg since 1970. Over the years they have expanded their business to four gift shops. 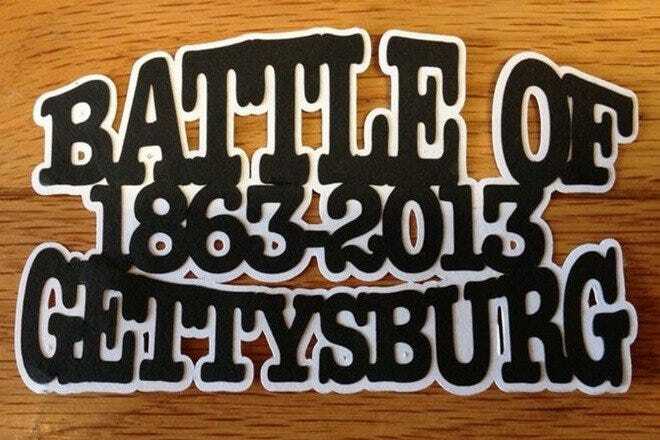 They are the official vendor of the 150th Commemorative Gettysburg merchandise. They're located on Baltimore Street across from Jennie Wade's House museum. In they inventory they have artwork, movies, collectibles, drink ware, toys, guns, knives, swords, jewelry, toys, apparel, and military items. They also sell limited edition items like a 13" cast resin statue of Generals Lee & Meade. The site where 17 On the Square stands has gone through a colorful 200+ year history of diverse ownership and equally diverse commerce. 17 On the Square is the premier antique mall located in the center of downtown historic Gettysburg, Pennsylvania. This multi dealer antique mall, 17 On The Square features items from over 75 dealers from as many as 9 states. They proudly feature Civil War Antiques both related to the Battle of Gettysburg and other antiquities from the Civil War Era. Dealers are constantly updating and changing their inventory. You'll find revolvers, insignias, belts, pistols and more. The store also has a place to grab a bite to eat, Lincoln's Sparrow Eatery. 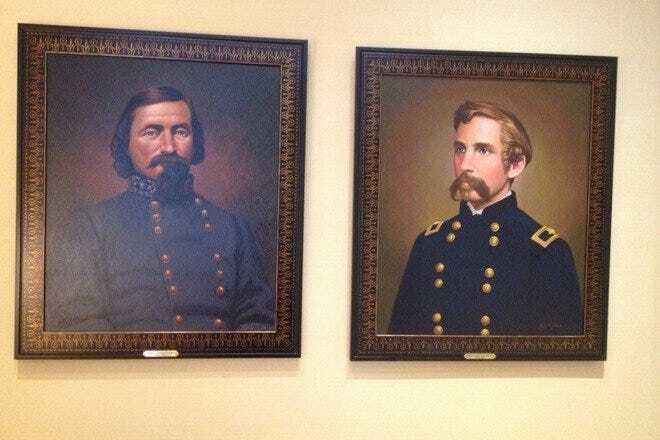 The Farnsworth Military Gallery is Gettysburg's premier dealer for Civil War artist Don Troiani's work. They also feature sculptures by Casteel, Jones, Tunison, and Hopkins, along with aviation art by Taylor and Trudgin. 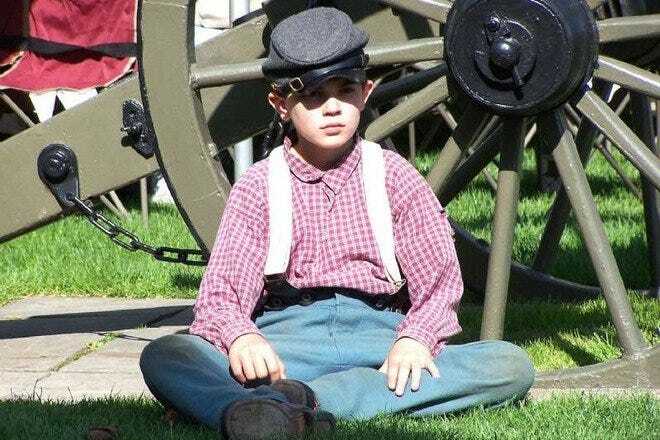 In addition, they offer a large assortment of Civil War books, relics and memorabilia. This is a good place to stop for anyone who is interested not only in the Civil War but all wars. You probably won't find this collection of Troiani's work anywhere else. When you're done shopping you can head over to the Historic Farnsworth House Inn, named in honor of Brigadier General Elon John Farnsworth, who led an ill-fated charge after the failure of Pickett's charge, claiming the lives of Farnsworth and 65 of his men. If you're looking for standard apparel shopping from big brand names then head over to the Outlet Shoppes. You can save between 20 and 70% everyday in over 70 outlet stores including Coach, Brooks Brothers, Under Armour, Gap, Aeropostale, and more new shops are opening often. You'll enjoy tax free shopping on clothing and shoes. They have gift certificates and complimentary wheelchairs for their guests in the Guest Services office. There's also a food court, cinema and Country Inn & Suites by Carlson. The outlet is located off Route 15 and Baltimore Street (PA 97), near the new Visitor Center. This is a great place to stop when you need a break from the Battlefield or before you start your exploration downtown. This gift store started in 1973. Originally it started out just selling German nutcrackers and smoking men but over the years has acquired things from all over the world. The current owner purchased the store seven years ago. Don't be confused from the outside - it's not a children's store. Inside you'll also find Santa's from Russia, religious icons, books for children. Some of their items are made in Italy, Denmark, Germany, Japan and more. There are also knick-knacks here and there as well as nativities, Patience Brewster ornaments, nesting dolls and the like. Visitors from all over stop in the store, especially to get their hands on the collectibles - the hand-carved German Civil War nutcrackers. 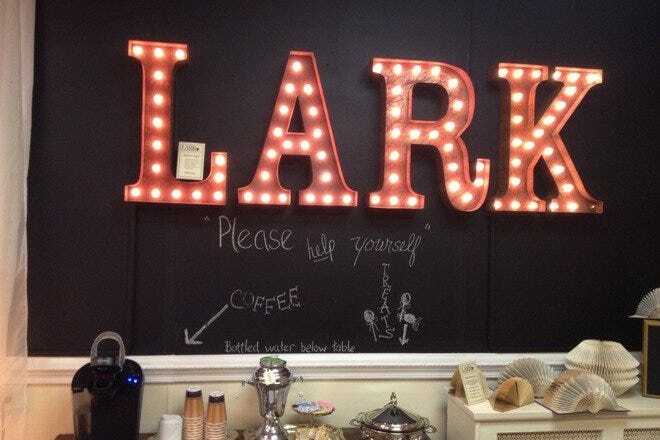 Lark gift store is located in downtown Gettysburg in a cozy space. They pride themselves on selling good things for living and for giving. Their gift shop is filled with unique, decorative and handmade goods. You'll see funky colorful pieces throughout the store like gurgle pots, uniquely designed stoneware pitchers; signs small and large, Dammit dolls, vintage glassware and China, lanterns, jewelry. Their marquee lights are a big draw. Head to the back of the store to sit down and take a load off. There's coffee and relaxing words to get you in the mood. If you happen to pass by a table with apothecary goods, double back and enjoy these handcrafted treats for the body. The Horse Soldier was established in 1971. 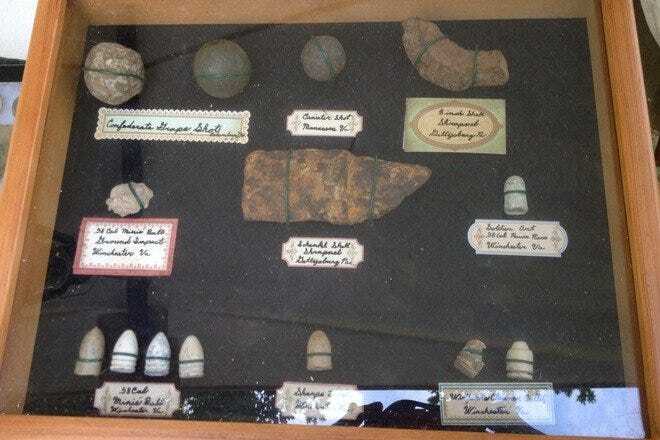 At the time the owners started to sell relics in their living room; mostly bullets, shrapnel, cannonballs and other excavated artifacts. This family owned and operated antique store specializes in military antiques and items dating from the Revolutionary War to World War II. However, there is a particular emphasis on fine artifacts and antiques from the Civil War. The inventory ranges from weaponry, artillery battlefield relics, and medical and musical instruments to soldiers' letters, autographs, and other documents. 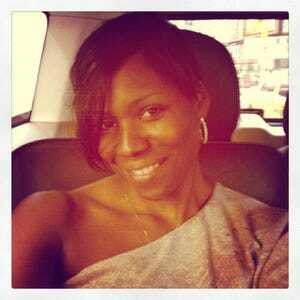 They will also buy or consign single items or collections and offer an appraisal service. 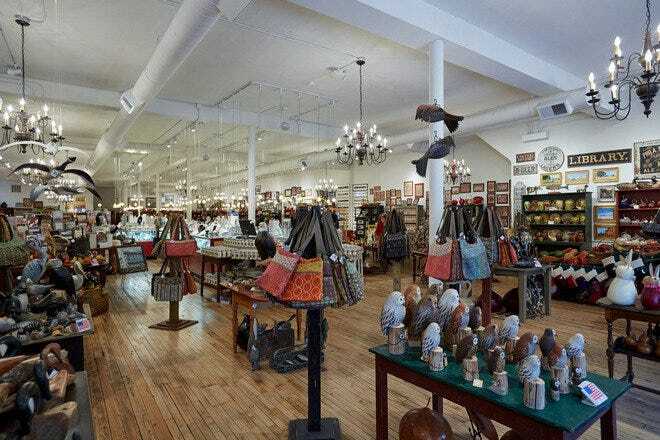 Located just off historic Lincoln Square, this lovely gallery offers a wonderful variety of original art, crafts, and jewelry handcrafted by local artisans. Handcrafted is what they specialize in as they support local artists. They've been around for 35 years and their success is apparent. In early 2013, they moved into a new space double their old size. Works include pastels by Marti Yeager and Kathleen Piunte, hand-painted prints by John Winship, and mixed media pieces by David Loveless. You'll also find a nice assortment of books about Pennsylvania and its history. They only have roughly four things in their inventory from overseas.